Welcome to my website. I hope you will find it interesting whether you are already familiar with my work or are looking at it for the first time. 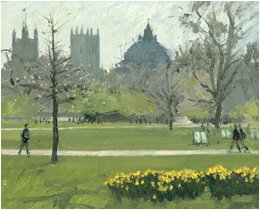 I am a landscape painter, working in oils or tempera direct from the subject - best described as painting en plein air. I travel abroad to warm and colourful places, particularly South Africa. At home in London I spend many happy hours in the nearby Fulham allotments, in St James’s Park and thereabouts, and on the banks of the River Thames. I keep a small canal boat, converted as a floating studio, on the Thames in Oxfordshire; this gives me the opportunity to paint wherever I choose up and down the river. Cornwall is another favourite location. The starting point for each of my paintings is being “moved” or “touched” by the subject - even, in the words of Alfred Sisley, having “fallen in love” with it. For practical reasons I work on a small scale. This makes it easier to carry my gear (try taking an easel and a large, wet canvas on the London Underground in rush hour!). More important, it enables me to complete a painting in one session before there is too much of a change in the direction of the light. I can revisit the scene on another day but the light and, for example, the state of the tide, will never be quite the same. Also, small paintings are affordable, and space can always be found for them. People often comment on the tranquillity of my landscapes. If only they knew what a struggle it can be to achieve this effect, working fast in ever-changing weather and often in noisy and distracting environments! Christopher Miers RBA: Born 1941. Over twenty-five one-man exhibitions from 1964. Exhibited RA Summer Exhibition regularly from 1985. 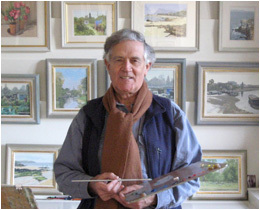 Elected Royal Society of British Artists 1985 (Trustee 1998-2005). Collections: Imperial War Museum, House of Commons, Sultan of Oman, Provost of Eton.